Hi friends! Happy Tuesday!! We are so excited to start up a new series on our blog. For the next several months we will be featuring one of our Twirl Brides as a guest writer on our blog as she journeys through engagement & marriage. Our hope is that this series can be a place that brides-to-be can come & feel like they're not alone in this adventure. We are firm believers of the importance of pointing one another to the bigger picture of all this wedding stuff -- YOUR MARRIAGE. Your wedding is one day but your marriage is forever. We want to inspire you, encourage you, and cheer you on as you walk through the journey of becoming a Mrs. And for those of you who aren't a bride-to-be quite yet, this is still for you too! You may not be in this season yet but it's still so important to continually direct yourself into a healthy mindset of what being a wife truly means. So, without further adieu, please say hello to Miss Mary Stallard who is the soon to be Mrs. Daniel Rouse!! We adore this girl and are so honored that she is not only one of our brides but also agreed to let us into her life and share with us all in the up's, down's, in's & out's of becoming a wife. Enjoy!! Hey y’all! I am so excited to share with you this treasured season of my life. When the lovely ladies at Twirl asked me to share about my life as an engaged, wedding planning, Kentucky gal, I jumped on the opportunity like Marcus Lee on a good night of rebounding that basketball! I guess for starters I should introduce myself. Hi, I’m Mary Stallard! By day, I am an Assistant Preschool Teacher/aspiring Etsy Shop Owner and I am engaged to the best man I’ve ever known, Daniel Matthew Rouse (he may kill me for including his middle name but I like it, so that’s that!) Daniel is in his last year of Physical Therapy school at the University of Kentucky working his booty off to earn his Doctorate of Physical Therapy. We call the beautiful city of Lexington, Kentucky home and cannot wait to sink our roots down deep into the bluegrass after we are married! For fun, I can be found making pretty things by doodling words down on paper, watching Gilmore Girls, or playing with my goldendoodle, Blue. Daniel can be found running the streets of downtown Lexington, studying, reading, and my favorite, laughing (I think he’s really funny). We met at a bonfire that our church hosted for the “20-Somethings” within our congregation in October of 2014. Fun fact: Liz Cox (Twirl’s manager) actually introduced us at this bonfire! Liz and Daniel had been good friends through YoungLife in high school and college and she and I had just met and instantly became best friends. On our first date, Daniel took me to a local spot called Josie’s for dinner and afterwards we took his parents’ minivan filled with our friends to see the Southern Lights at the Kentucky Horse Park (we both had grown up going to see the Southern Lights so it was fun to do this together and with people that we love!) Eight months later, Daniel was down on one knee at the esteemed Henry Clay Estate asking me to be his wife with my best friends photographing and videoing the whole thing! After the proposal Daniel had planned a surprise engagement party at our dear friend’s house complete with about 50 close family and friends and tacos. That day has gone down in my heart as one of the most special days of my life and luckily, it was all documented for us to enjoy for the rest of our lives! Daniel and I are simple people. We love tacos and watching Netflix on a Saturday night. We also love people and incorporating them into our lives. It has been so much fun being in a relationship with someone who loves people so much and so well. You can find us drinking beer on a Friday while eating the impeccable tacos at Local Taco with friends (have I mentioned yet that I love tacos? Ha!) or cheering on the Kentucky Wildcats during football and (mainly) basketball season. We love our state and the people in it! We are so grateful and fortunate to be surrounded by such an extraordinary community. 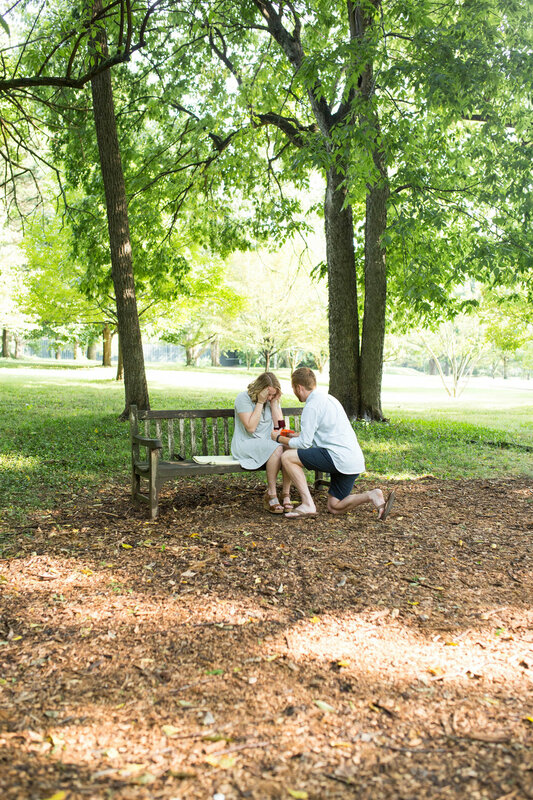 I can’t wait to share more about this process of being engaged and planning a wedding with you all! So far, I haven’t turned into a bridezilla (I think) and I haven’t been very stressed (yet)! Here’s to hoping that continues for the next five months!